Diamonds "The Lack of Color"
The diamond color evaluation of most gem-quality diamonds is based on the absence of color. 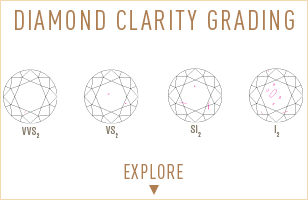 A chemically pure and structurally perfect diamond has no hue, like a drop of pure water, and consequently, a higher value.GIA's - D to Z.
Diamond color-grading system measures the degree of colorlessness by comparing a stone under controlled lighting and precise viewing conditions to master-stones of established color value. Many of these color distinctions are so subtle that they are invisible to the untrained eye; however, these distinctions make a very big difference in diamond quality and price. Why does the GIA Color system start at "D"? Before GIA universalized the D-to-Z Color Grading Scale, a variety of other systems were used loosely, from A, B, and C , to Arabic (0, 1, 2, 3) and Roman Numerals (I, II, III), to descriptive terms like “gem blue” or “blue white,” which are notorious for misinterpretation. So the creators of the GIA Color Scale wanted to start fresh, without any association with earlier systems. 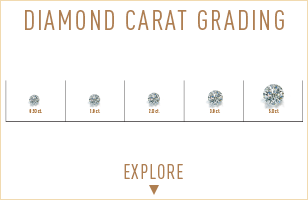 Thus theGIA scale starts at the letter D.
In the normal color range, the closer a diamond gets to colorless, the higher its per-carat price. There’s an especially large leap in the price of a colorless diamond, which is extremely rare. 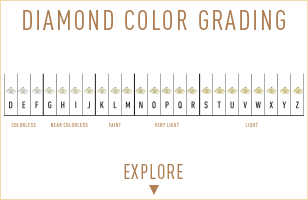 Are Diamonds Graded As Z's Considered Fancy-Color? No. Naturally colored diamonds outside the normal color range are called fancy-color diamonds. The FTC provides no guidelines for the use of the term “fancy-color” in the US, but there is general agreement in the international trade that fancy-color diamonds are either yellow or brown diamonds that have more color than a Z "masterstone" or they exhibit a color other than yellow or brown. While the vast majority of diamonds fall in the D-to-Z color range, nature occasionally produces diamonds with a naturally occurring blue, brown, pink, deep yellow or even green hue. The geological conditions required to yield these colors are rare, making diamonds with distinct and naturally occurring shades scarce and highly prized. Unlike colorless and near-colorless diamonds, fancy color diamonds are evaluated less for brilliance or fire and more for color intensity. Shades that are deep and distinct are rated higher than weak or pale shades.